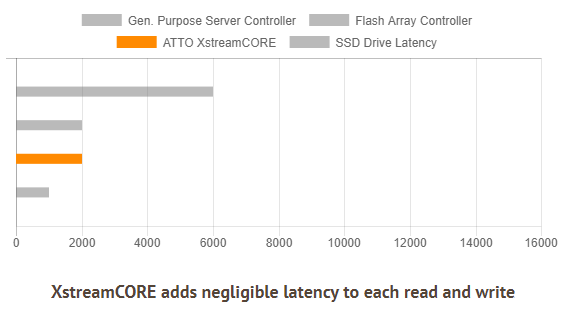 The XstreamCORE ET 8200 achieves up to 1.2M 4K IOPS and 6.4GB/s throughput per controller with only 2 microseconds of added latency. 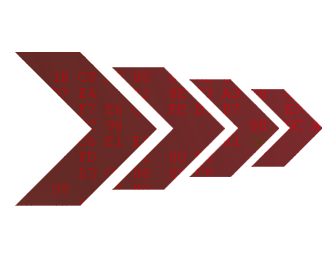 XstreamCORE supports Extended Copy (LID1) data mover commands and will offload up to 5.2GB/s of data from CPU, memory, networks and storage fabrics leaving more resources for VMs and applications running on the host. Build solutions with up to 960 SAS SSD/HDD devices behind a pair of controllers and better manage, monitor and utilize this storage with current and future features built into XstreamCORE. ATTO XstreamCORE storage controllers act as external adapters adding a common set of services and features to flash SSD and HDD based JBOD, JBOF or RAID storage and SAS tape devices. 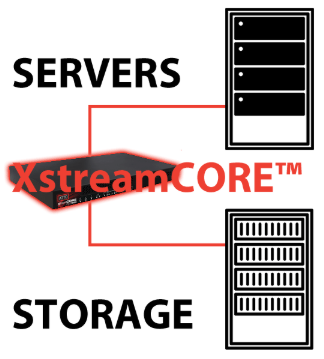 XstreamCORE then remotely shares this storage over long or short distances using high speed Ethernet technology. Use cases for these controllers include the remoting of storage from servers or other storage mediums over an Ethernet network, sharing a pool of high speed flash to multiple Ethernet connected systems, connecting data centers for business continuity via a stretch cluster and disaggregating storage from servers to independently scale compute and storage. 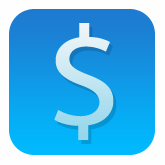 ATTO eCORE Control Engine technology provides un-accelerated command processing for management services, storage services and integration with third party IP. eCORE has full access to all on-chip resources to add common, open storage services, storage routing, diagnostics, one pane of glass interfacing and host mapping functions while managing all performance metric reporting and data mover functions. With direct access to hardware drivers, enclosure management I/O signals and busses, eCORE is an efficient tool that virtualizes services and features. xCORE data acceleration technology features multiple parallel I/0 acceleration engines with end to end I/0 processing, hardware buffer allocation management and real-time performance and latency analytics.